With the optional (but recommended) CBT typically completed within 90 days, the program blends within the framework of one’s everyday life, in conjunction with 12 months of discreet Peer Recovery Support (PRSS) and Recovery Coaching after care. This cutting-edge, proven, and effective treatment modality is available to those who are committed to sobriety, feel this program is the right opportunity and have been medically cleared. According to the National Institute on Alcohol Abuse and Alcoholism (NIAAA) part of the U.S. Department of Health and Human Service (HHS) and their 2006 ‘COMBINE’ study – (Combining Medications and Behavioral Interventions for Alcoholism) – the best outcomes in naltrexone therapy are a result of receiving naltrexone along with outpatient behavioral-modification counseling. The BioCorRx® Recovery Program, in compliance with NIAAA and HHS guidelines, has expanded significantly on this concept with our in-depth CBT counseling and 12-month support program. The comprehensive BioCorRx® Recovery Program blends aggressive medical management in the form of a simple procedure, involving the subcutaneous insertion of specially compounded implants (pellets) which contain the FDA approved medication naltrexone. This medication can be combined with customized, structured, and focused one-on-one Medication-Assisted-Treatment counseling sessions, specific to Naltrexone. Naltrexone is an opioid antagonist that removes the “pleasure feelings” in the brain that respond to opioids and alcohol when consumed. Once implanted just beneath the skin in the lower abdominal area, the completely biodegradable naltrexone implant slowly releases the drug into the body over several months and eliminates or significantly reduces the cravings for drugs and alcohol in most people. It can also block the effects of other drugs. Program participants have reported minimal to no physical discomfort during the procedure. The procedure requires only local anesthetic and typically takes less than 20-30 minutes to perform. More importantly, within an hour or so of receiving the naltrexone implant, participants have reported feeling complete freedom from drug and alcohol cravings. Many have reported returning to work the same day. Depending on the treating physician, participants may typically return periodically for follow-up well checks/incision inspection. Some patients may require longer term medical care depending on individual situations. Next, BioCorRx® developed a multi-session counselling program identifying 35 key areas essential to early treatment in Substance Use Disorders. Delivered through comprehensive modules, these key concepts include specific instructions which address often unidentified key components essential to behavioral change in Substance Use Disorders. Written by addiction experts with decades of combined experience, the program is specifically for use with those being treating with sustained released naltrexone. Credentialed addiction counselors meet certain criteria before they are trained and certified in the BioCorRx® Counseling Program. Participants generally complete the counselling modules within 90 days of receiving the implant. Additionally, BioCorRx® has expanded the support structure to include 12 months of a peer-support system utilizing trained recovery specialists usually matched to the consumer based on age, gender, etc. Typically, soon after the counseling modules begin, the patient is ready to enter the Recovery Support Specialist (RSS) portion of the program. This support segment, when implemented, includes very convenient weekly or bi-monthly interaction via telephone for over 12 months. In most cases, there is a period of overlap with counseling and RSS care occurring simultaneously. This combined approach results in a comprehensive recovery program designed to pro-actively support the recovering individual’s journey for around 12 months (assuming completion of aftercare program). How is the BioCorRx® Recovery Program different? Unlike most traditional recovery programs which invest the first 30-90 treatment days in assisting a patient to deal with the physical cravings of addiction, BioCorRx® Program participants are typically absent the physical cravings on day one, and thus can focus clearly without distraction on the information, concepts, change, and education presented in the counseling program to learn and implement unrealized coping strategies and healthy behaviors. The implant used in the BioCorRx® Program tends to last longer than others available in the U.S. as evidenced by clinical outcomes (time lengths vary depending on the individual). Other naltrexone implant providers tend to simply perform the procedure and do not include a structured naltrexone early-recovery focused counseling program. Those that do include programs, tend to offer life coaching only referring patients to outside centers with no continuity of care or follow-up. No other recovery program of which we are aware provide MAT counseling modules specific to the naltrexone therapy and 12 months of peer support and tracking post-implant procedure. Receive one pre-implant counseling session. Receive 16-20 One on One counseling sessions over course of next 90 days or less. Is “Relapse is Part of Recovery” Just a Convenient Excuse? Addiction and Codependency: Why so common? Coming Off the Pink Cloud in Sobriety: What Can I Expect Next? What is the BioCorRx Recovery Program? The BioCorRx Recovery Program is an outpatient medication-assisted treatment (MAT) program for alcohol and opioid drug addiction. The comprehensive program is comprised of three parts: (1) an implant, of a proprietary compounded formulation of the non-addictive medication, naltrexone. The naltrexone implant, which is prescribed by a licensed physician and implanted under the skin, can reduce the cravings for opioids and alcohol, and block opioid euphoric effect, over an extended period of time; (2) uniquely and specifically structured, intensive one-on-one addiction counseling program developed by BioCorRx, Inc.® (the “Counseling Program”) and (3) up to 12 months of expert Recovery Support Specialist sessions via phone, Skype or in-person, matched to you in terms of age, race, gender, etc. Most Specialists are in recovery or have recovered both within and outside of the BioCorRx Program. What is Medication-Assisted Treatment (MAT)? According to the National Institute on Alcohol Abuse and Alcoholism (NIAAA) part of the U.S. Department of Health and Human Service (HHS) and their 2006 ‘COMBINE’ study – (Combining Medications and Behavioral Interventions for Alcoholism) – the best outcomes in naltrexone therapy are a result of receiving naltrexone along with sixteen weeks of outpatient behavioral-modification counseling. The BioCorRx® Recovery Program, in compliance with NIAAA and HHS guidelines, has expanded on this cutting-edge concept. Naltrexone is an FDA approved medicine that serves as an ‘opioid receptor antagonist’, meaning Naltrexone blocks alcohol and opiates from activating the pleasure centers of the brain, and thus used to treat the dependence on them. Naltrexone blocks certain receptors in the part of the brain that trigger dopamine release and reinforces the vicious and compulsive addiction feedback loop. When these areas of the brain are blocked, the craving for alcohol is either eliminated entirely or at the bare minimum, significantly reduced. Then it naturally follows that the likelihood of drinking is either eliminated entirely or significantly reduced. And if alcohol is consumed, the pleasure is basically non-existent and any potential relapse is largely neutralized. 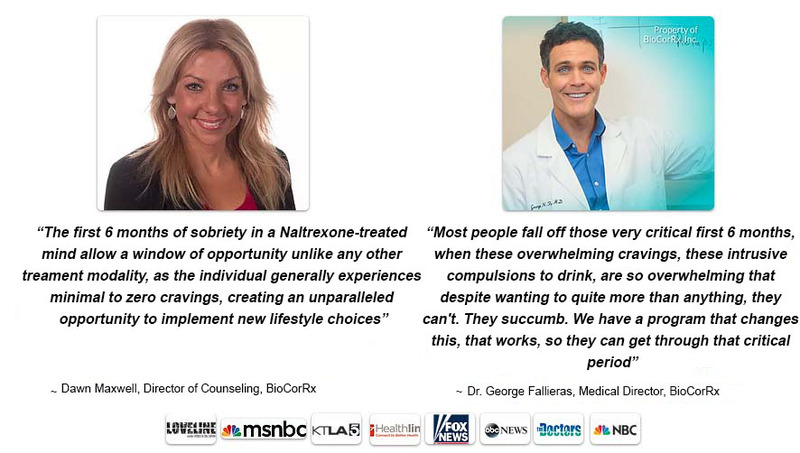 Please Note: igotsober Recovery is an official partner for the BioCorRx Recovery Program. We are not a medical facility and offer no medical advice. We partner with licensed medical doctors, therapists and certified Peer Support Specialists to offer the BioCorRx Recovery Program as an opportunity for alcohol/addiction recovery, and any participation is at the sole discretion of the individual. igotsober Recovery offers only recovery coaching and consultations on premises. There is no ‘cure’ for addiction. For more information, please visit www.biocorrx.com and www.beataddiction.com.